Here's a list of the best main floor master house plans for 2018. Want to see more plans? Click here: Send me floor plans! The Glenview has a master bedroom on the first floor - with 4 bedrooms, 3 baths. The Glenview offers a master bedroom on the first floor, with two-step trey ceiling, walk-in his and hers closet, soaking tub and alcove shower. The vaulted office features wood beams in the ceiling. 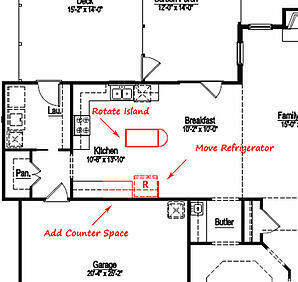 The island kitchen is designed for entertainment, with bonus and game rooms upstairs. The exterior has a white painted brick front with country style front porch. The Sullivan is a very popular floor plan by Frank Betz with 4 bedrooms, 3 baths. The Sullivan's main floor master suite extends the entire length of the home, with his and hers closets and a cozy sitting area with lots of windows. The vaulted great room emphasizes the open floor plan, with an island kitchen designed for entertainment and a big bonus room upstairs. 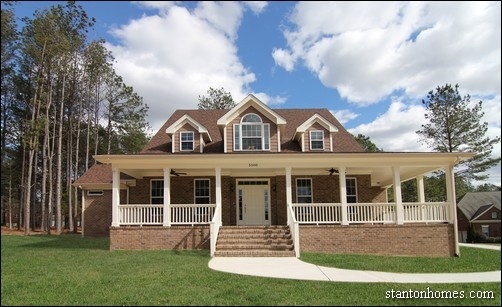 This brick front home version has archways, trey ceilings, and hardwood staircase. 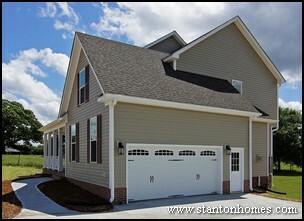 The Blueridge is a Max Fulbright floor plan with 4 bedrooms, 2.5 baths. 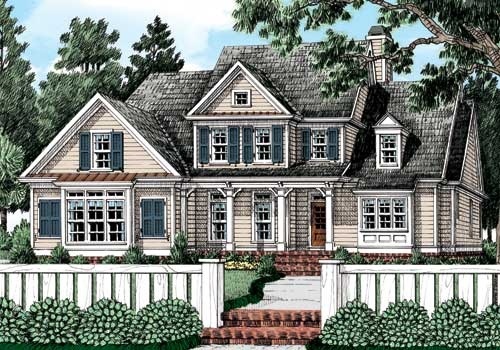 This English Country Exterior floor plan has a first floor master suite, open layout, and upstairs media and craft rooms. See photos of the stained wood beam ceiling in the great room, two tone island kitchen, and painted wainscoting dining room. 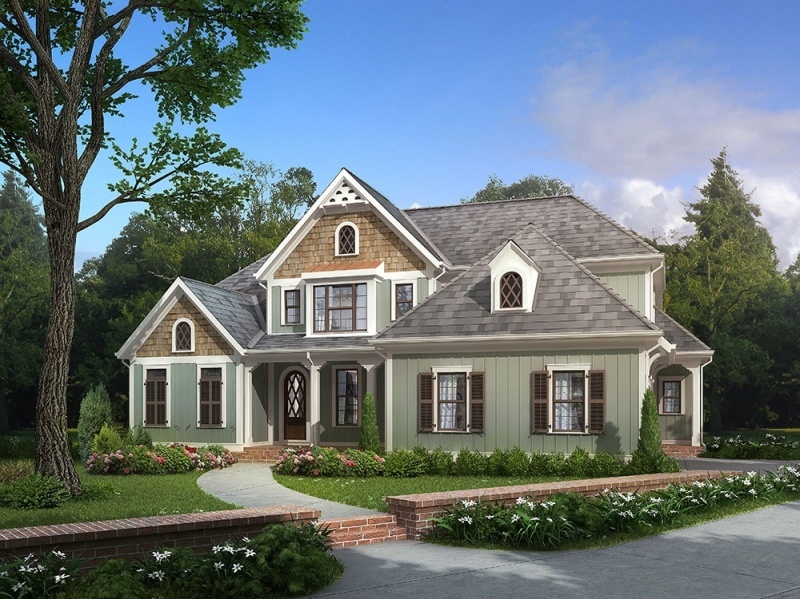 The Low Country Farmhouse is a Max Fulbright floor plan with 4 bedrooms, 3.5 baths. This Farmhouse plan has a traditional feel inside and out with a main floor master suite, large kitchen island open to the great room, separate dining and breakfast rooms, and three kid's bedrooms upstairs with a small loft overlook to the two story great room. The front porch wraps around three sides of the home, with a separate covered patio in the backyard. The "Costco" style pantry is large enough for long-term storage of canned goods grown on the acreage farmland where this home sits outside of Raleigh, NC. This is a modified version of The Dinsmore, a Frank Betz floor plan, with 5 bedrooms, 4.5 baths. 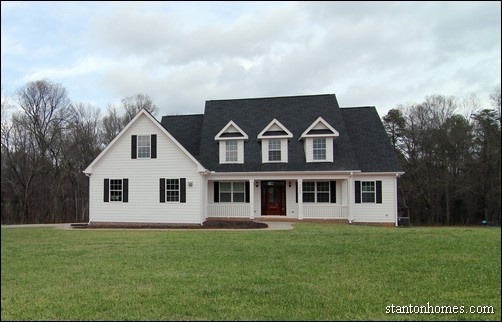 This NC custom home offers an open concept floor plan with two story great room and foyer, large master suite with vaulted ceiling and island in the master closet, window bench in the loft, drop zone in the mud room. 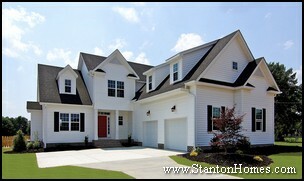 The Bryson is a custom design by Stanton Homes with 4 bedrooms, 3.5 baths. This version of the Bryson includes incredible exterior detailing, with each element carefully blended for scale and impact. The first floor master suite and even a "Dog Shower" are noteworthy. 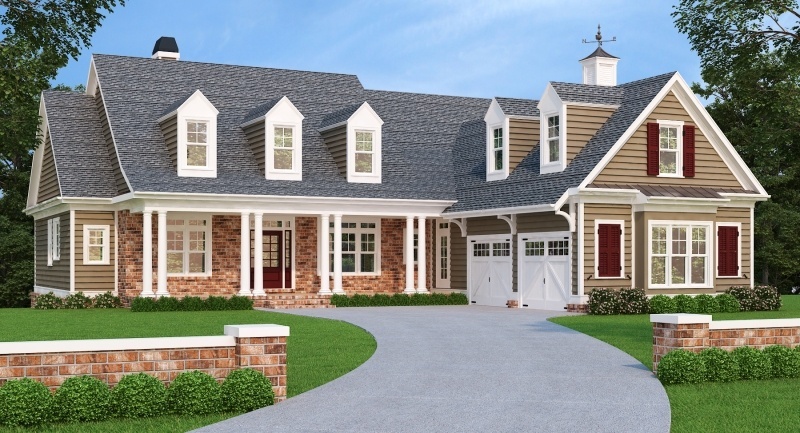 The Bellemont is a classic modern Craftsman with four beds, 3.5 baths. The tucked-in front porch is just the beginning - step inside this main floor master home, and see how well the open concept rooms flow. The well-designed master suite is to the left off a private hallway, and the open island kitchen includes a great walk in pantry. 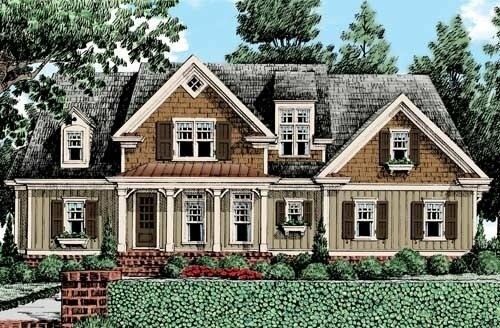 The Autumn Brooke is a Storybook Arts and Crafts design with 4 bedrooms, 3.5 bathrooms. The Vaulted Keeping Room and Vaulted Master Suite both feature lots of extra windows, and the Jack and Jill bath is a favorite for the kids. The Shoal Creek is a Frank Betz floor plan with 4 bedrooms, 3 bathrooms. The Shoal Creek is a main floor master two story home with a guest room on the first floor. It's an open floor plan, with a vaulted family room and spacious island kitchen. This version combines a medley of classic Craftsman design features - like the stone porch columns and stone fireplace - and modern finishes, such as the kitchen pendant lights. Outdoor living is a big deal, too, with an extensive deck. 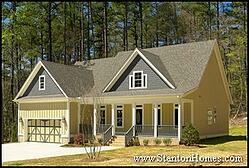 The Statesman is a custom floor plan by with 4 bedrooms, and 4 baths. 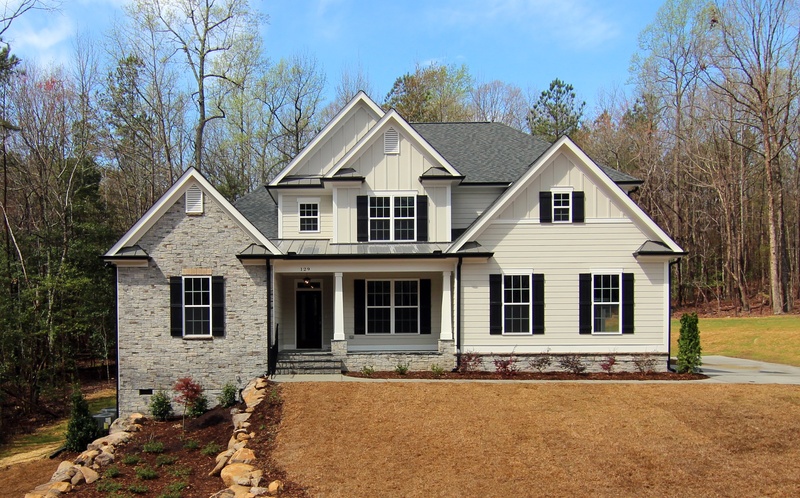 This custom floor plan by Stanton Homes draws in traditional home elements such as red brick, black shutters, and white columns, with the modern layout of a downstairs master suite and first floor guest suite. 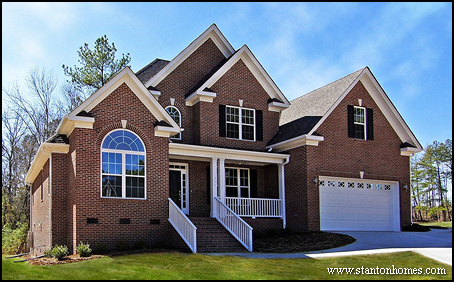 Contact Stanton Homes at 919-278-8070 or send us your questions, here, and we'll help you find the right main floor master floor plan for your new home. Looking for house plans with a main floor bedroom? Here are some of the best main floor master house plans and main floor guest bedroom house plans being built in 2017. Want to see more plans? Click here: Send me floor plans! 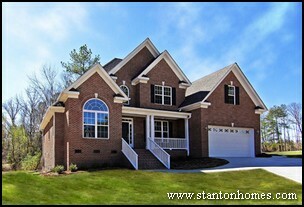 All of these homes are available - or coming soon - the Chatham County, NC. Get more information about these homes, including the address, cost, features, and availability. The Cassiopeia is a very popular downstairs guest bedroom floor plan with 3,144 Sq Ft, 4 bedrooms, 3 baths. The downstairs includes a ship lap mudroom, open concept kitchen and living, formal dining, and barrel vaulted foyer. The separate, family-sized laundry, two bonus rooms, and loft areas are just upstairs. 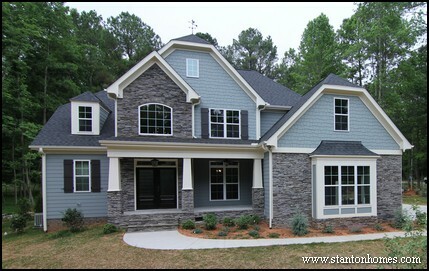 This stone front home has built-ins, trey ceilings, and a hardwood staircase. See the Cassiopeia Photo Gallery, here. The Autumn Brooke is a Frank Betz floor plan with 3,150 sq ft, main floor master bedroom, 4 bedrooms, and 3.5 baths. This main floor master house plan comes with a modern layout: downstairs master suite, vaulted home office, separate mud room and laundry room, huge walk in pantry, game room, Jack and Jill bath for kids, and luxury master bathroom design. See the Autumn Brooke Floor Plans, here. 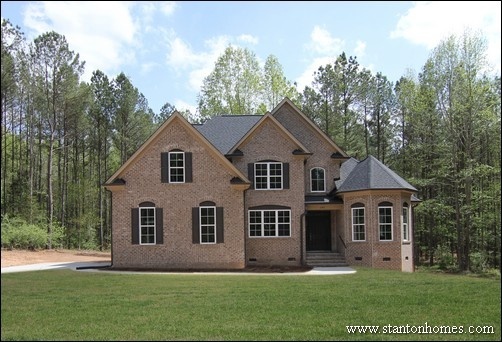 The Blueridge is a Max Fulbright floor plan with 3,185 Sq Ft with 4 bedrooms, 2.5 baths. See the Blueridge Photo Gallery, here. The Bellemont is a custom version of an American Gables Home Designs, Inc. floor plan with 3,358 Sq Ft, 4 bedrooms, 3.5 baths. 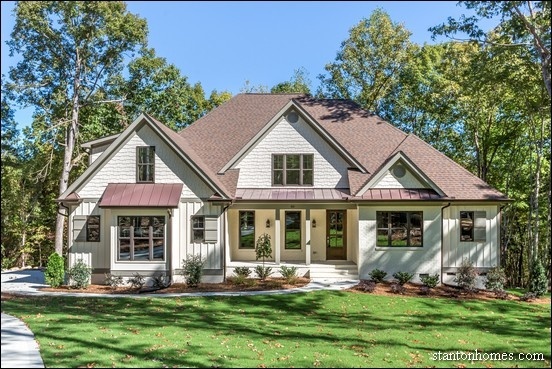 This Chatham County custom home includes a vaulted first floor master with rough Cedar beams, huge island kitchen with walk in pantry, oversized laundry room, and much more. See the Bellemont Photo Gallery and Floor Plans, here. The Glenview is a downstairs master bedroom house plan with 3,311 sq ft, 4 bedrooms, 3 bathrooms. The Glenview is a Frank Betz floor plan with main floor master, island kitchen, vaulted great room, Jack and Jill bath, laundry with built in sink, hallway drop zone bench, game room and separate bonus room. 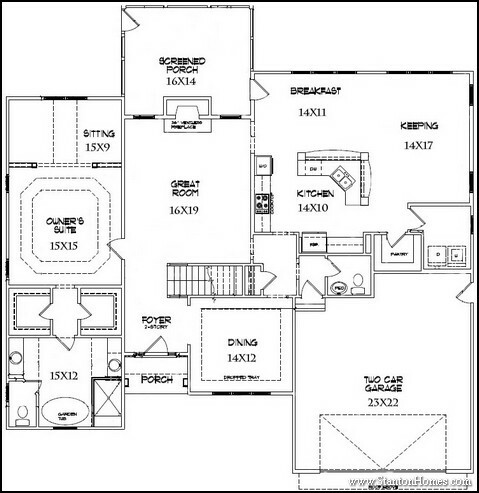 See the Glenview Floor Plans, here. The Cabot is a downstairs master bedroom Frank Betz floor plan with 3,430 Sq Ft, 4 bedrooms, 4.5 baths. The Cabot offers a first floor master AND guest suite with private bath, island kitchen with Secret Pantry, large mudroom, secret entrance to laundry from master closet, game room, and separate loft. Get a flyer for the Cabot here. 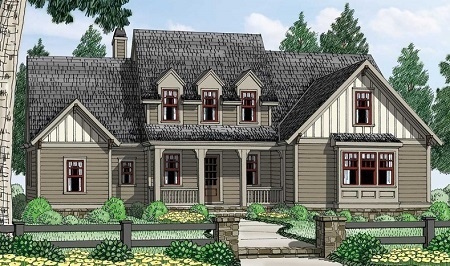 The Mackinaw is a custom version of the Frank Betz floor plan design with 3,360 sq ft, 4 bedrooms, 3 baths. This new home floor plan features: First floor Guest Suite, Open Concept Floor Plan with Island Kitchen, Laundry with Drop Zone, Loft, Media Room, Bonus Room. See the Mackinaw Floor Plan - and Schedule a Visit - here. 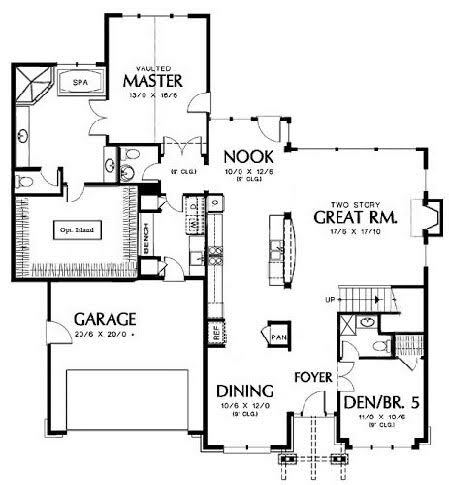 The Sullivan is a very popular floor plan by Frank Betz with 2,548 Sq Ft, 4 bedrooms, 3 baths. See the Sullivan Photo Gallery, here. 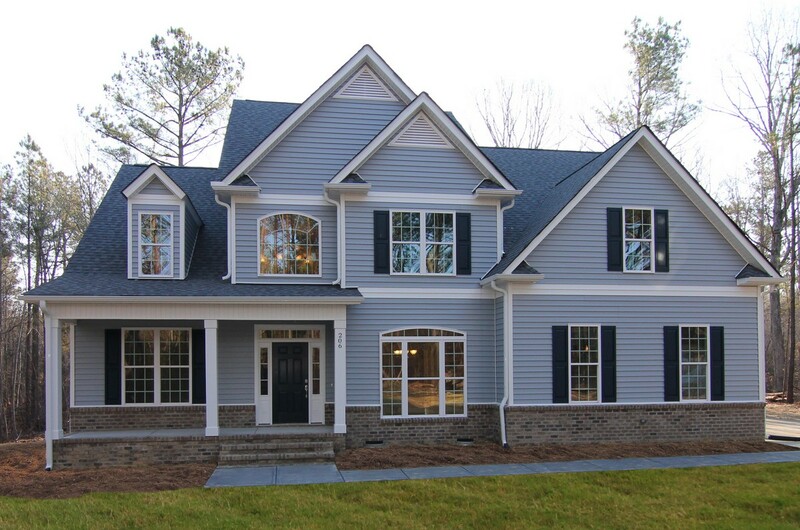 The Sawyer is a custom home floor plan with 2907-3245 Sq Ft with 4 bedrooms, 3.5 bathrooms. 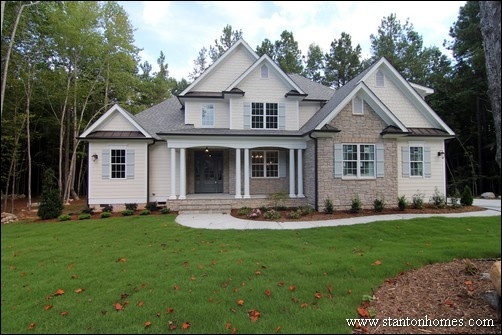 This Raleigh custom home offers a downstairs guest room and upstairs master suite. The island kitchen opens to the casual dining and great room. The kids bedrooms connect through a secret passageway. 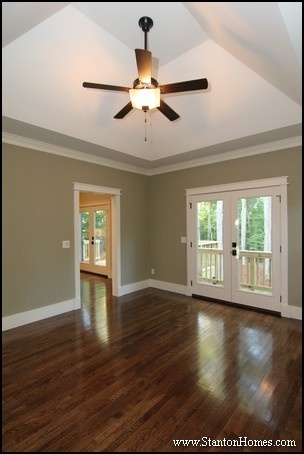 See the Sawyer Photo Gallery and Floor Plan, here. 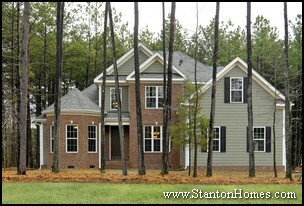 The Hanover Pointe is 3529 sq ft with 5 bedrooms, 3.5 bathrooms, and a main floor master bedroom. This North Carolia new home offers two more bedrooms on the first floor, separate mud and laundry rooms, and large island kitchen. See the Hanover Point Floor Plans, here. 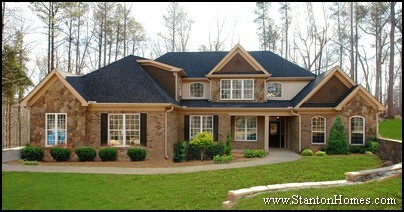 The Highland Place is 3,414 Sq Ft with 4 bedrooms, 3 bathrooms with a first floor master bedroom. This new home floor plan features: Curved Island Kitchen, Vaulted Great Room, Separate Mud Room and Laundry with Built ins, Drop zone, Downstairs Guest Bedroom, Game Room, Bonus Room, and Loft. See the Highland Place Floor Plans, here. 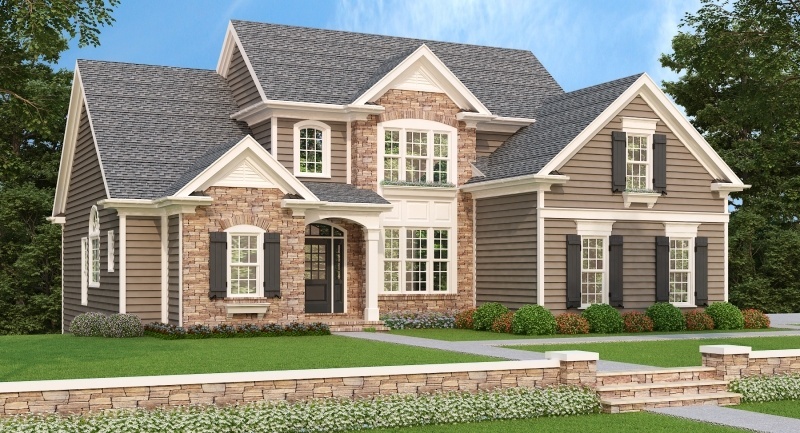 The Lytham is 2503 sq ft with 4 bedrooms, 2.5 bathrooms, and a main floor master bedroom. See the Lytham Floor Plans, here. 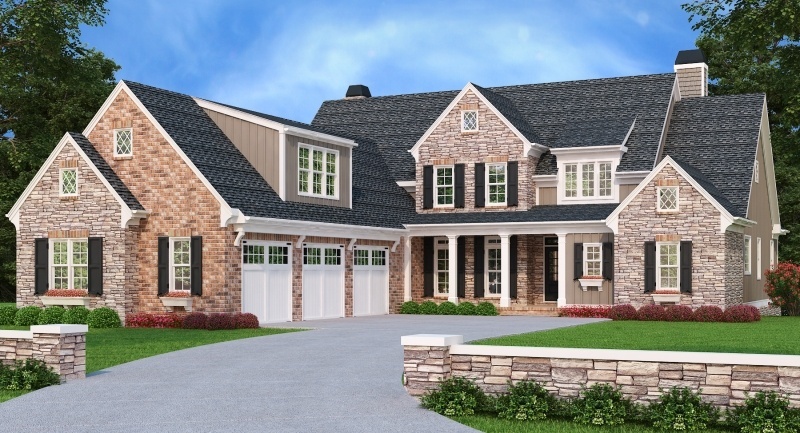 The Saxony is 4428 sq ft with 4 bedrooms, 4 bathrooms, and a main floor master suite. 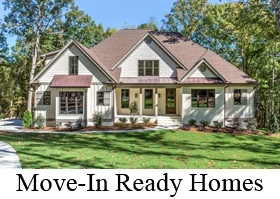 This Chatham County new home has a downstairs guest bedroom, separate mud room, and keeping room. See the Saxony Floor Plans, here. 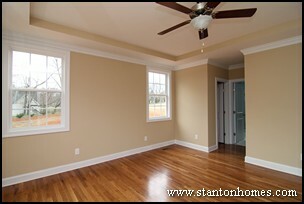 As your considering main floor master floor plan options, contact custom home builder Stanton Homes. We'll help you find the right floor plan - even if it means modifying room sizes and layouts. Why do main floor master homes cost more? Two-story homes with a main floor master bedroom will usually have a higher per square foot cost than a two-story home with all bedrooms located on the second floor. Judging homes by the "cost per square foot" can be misleading. Instead, ask "What's included in the cost per sq ft?" 1. Why main floor master homes cost more: Where's the Sq Ft? The differences in how square footage is distributed add to the cost of building a home. Given two homes of essentially the same square footage - both with three bedrooms, with the option of either a 4th bedroom or some additional living/entertaining space - the rooflines, exteriors, footprints, framing, and garage locations can all be quite different. A main floor master home is usually more spread out, with a larger first floor, than it's equivalent second floor master home. 2. Why main floor master homes cost more: How large (and complex) is the roof? 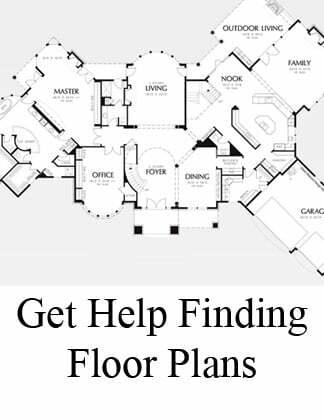 A plan with a main floor master usually has a lot more roof. More roof means higher costs for several reasons. 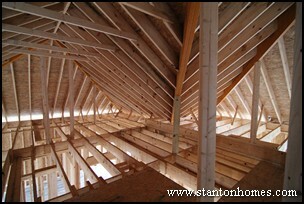 - A steeper roof is taller, thus more framing labor and materials are needed. But an advantage can be increased attic height and space. - Each time the roof line changes, more framing materials (and labor) are needed. A higher level of expertise is required - which can also increase framing costs. - There's just plain more roof when the first floor size increases. That means higher labor and material costs for roofing. 3. Why main floor master homes cost more: What does framing have to do with home cost? There are several reasons costs will increase, especially with this main floor master plan. - There is greater square footage on the first floor. Even though the second floor is smaller, that will not compensate - all the walls must still extend upwards until they reach the roof. - Any time there is an extra "corner", costs increase. More materials are used, and more can be wasted making additional cuts for varying lengths. More labor is required. - More exterior wall means more heavy-duty framing, more sealing, more insulation, and, of course, more labor. There's also reason a lot of builders charge extra for vaulted, cathedral, or trey ceilings! Cathedral and vaulted ceilings can require extra beams, different framing techniques, longer than standard framing materials, and more. 4. 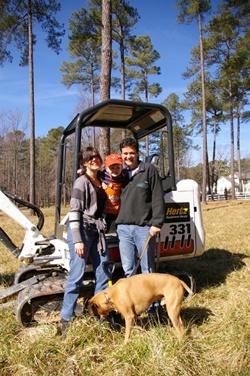 Why main floor master homes cost more: Where is your homesite, and what "tractor work" is required? 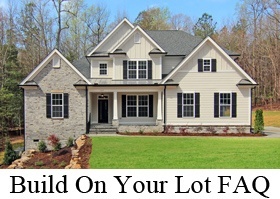 An experienced custom home builder can walk your lot to help determine expected site costs. A larger site will need to be prepared for a main floor master home of equal square feet to a second floor master home. There will be slightly higher charges for grading and foundation preparation. 5. 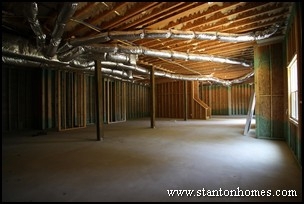 Why main floor master homes cost more: Is the foundation a slab, crawlspace, or basement? If you don't know what type of foundation your new home will require - don't worry! 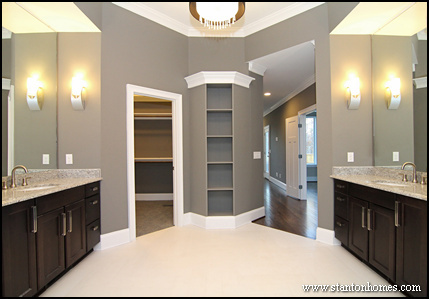 The team at Stanton Homes can walk you through the differences in types of foundations, and explain what your floor plan and home site require. Why does a main floor master foundation cost more? The "footprint" of the home includes not only the square footage of the "heated" or living space on the first floor, but also that of the garage. The foundation costs will higher for the plan with the first floor master bedroom, because the first floor is larger. 6. 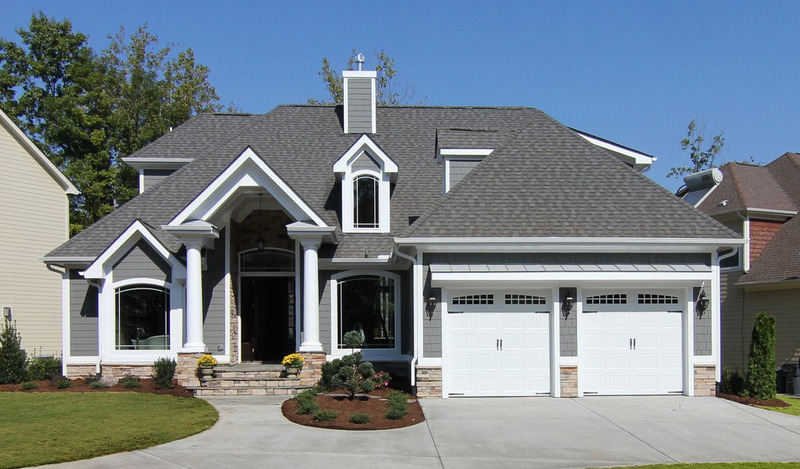 Why main floor master homes cost more: Is the garage a side entry? 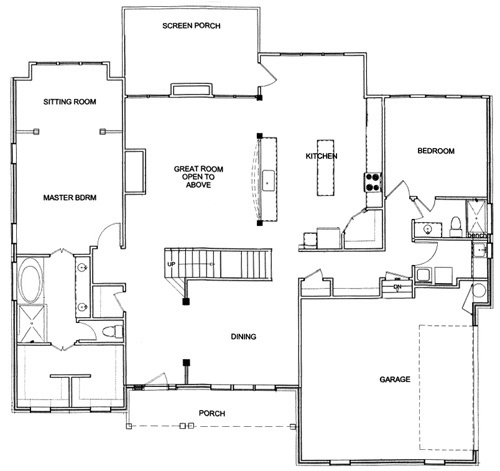 Not all main floor master bedroom floor plans have side entry garages. But if the home plan you choose does, the driveway and pathway costs may be slightly higher - it all depends on how the home is situated on the lot. The home may also require a few more windows, to "dress up" the front face of the garage. How Much More do Main Floor Master Homes Cost? In general, a homebuyer can expect to pay about 10-20% more per square foot for a home with a main floor master suite than one that has about the same square footage on both floors. - Is the lot cost the same for both homes? - Do both homes have the exact same interior and exterior finishes? Even more important - does moving the master bedroom downstairs substantially increase the size of the first floor, while leaving a reduced size second floor? 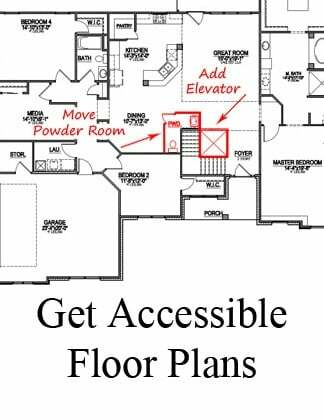 There are home plans available in which the master bedroom is downstairs, but the plan still includes a "full" upstairs. In a situation like this, the only way to "fit" the master bedroom downstairs is to lose some living space - the sizes of the other rooms have to shrink, and you may lose a living room or office - but have a larger bonus room upstairs. There won't be any vaulted rooms, but the overall square footage for the price can increase. 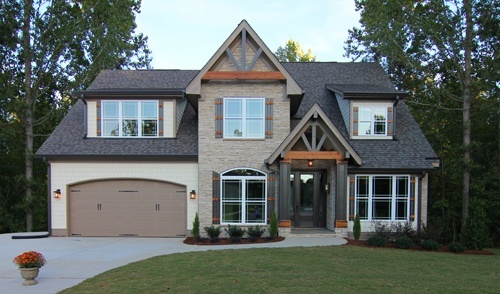 Main Floor Master homes were the most popular floor plan layout selected by home builders for the Triangle Parade of Homes, especially for areas like Chapel Hill and Pittsboro. See the stats here. Looking for house plans with a main floor master? Here's a list of the best main floor master house plans for 2017. Want to see more plans? 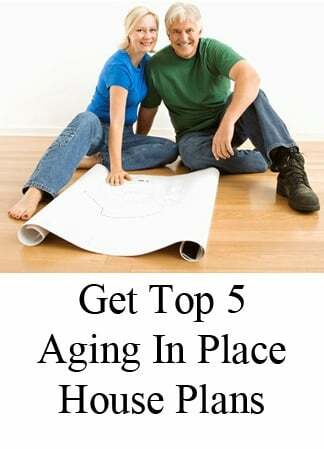 Click here: Send me floor plans! The Statesman is a custom floor plan by with 3,160 sq ft, 4 bedrooms, and 4 baths. See the Statesman Photo Gallery, here. 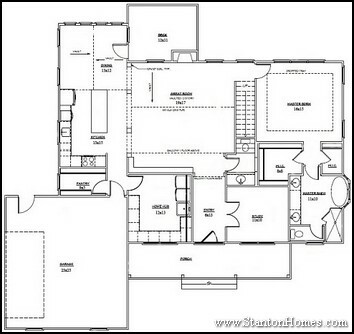 This is a modified version of The Dinsmore, a Frank Betz floor plan, with 3,008 sq ft, 5 bedrooms, and 4.5 baths. 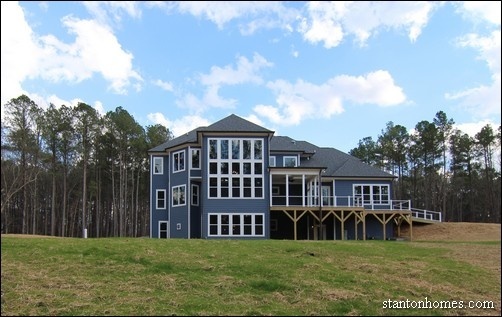 This Apex, NC custom home is a trendy, sophisticated Urban Lodge with design features that say "young executive" - with an emphasis on family and entertainment. See photos of: white oak hardwood flooring, stone and siding accent walls, cedar wraps, and open concept living with built-in storage tucked throughout (island in the master closet, window bench in the loft, drop zone in the mud room). See the Dinsmore Photo Gallery, here. 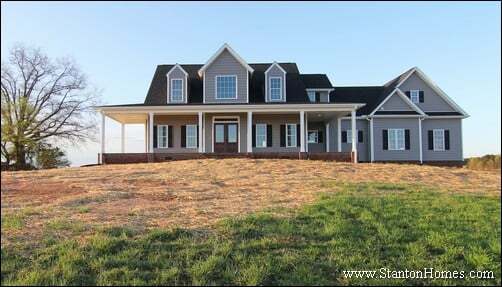 The Carwile is a farmhouse floor plan with 2,868 sq ft, 4 bedrooms, 2.5 bathrooms. From the apron sink in the white and black kitchen to the light blue master bath with cantilever tub, this first floor master suite home speaks to a classic farmhouse style. See the Carwile Photo Gallery, here. 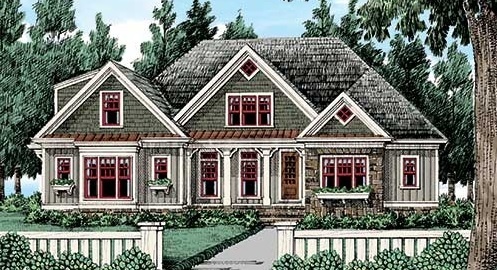 The Low Country Farmhouse is a Max Fulbright floor plan with 2,622 Sq Ft, 4 bedrooms, 3.5 baths. See the Low Country Farmhouse Photo Gallery, here. 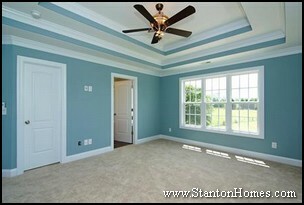 The Dugan is a custom design by Stanton Homes with 3,184 sq ft, 4 bedrooms, 3.5 baths. This version of the Dugan - a fully wheelchair accessible custom home - includes a second floor mother in law suite with elevator. 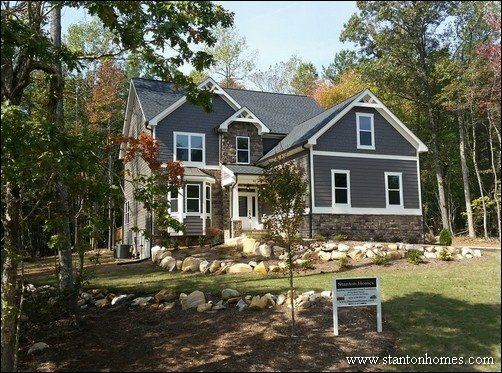 Stanton Homes is a certified Aging in Place builder, as well as an industry leading Specially Adapted Housing (SAH) approved builder in central North Carolina, with an innovative, technology-driven approach to customized, functional and beautiful fully accessible and universal homes. See the Dugan Photo Gallery, here. The Shoal Creek is a Frank Betz floor plan with 2,765 sq ft, 4 bedrooms, 3 bathrooms. See the Shoal Creek Photo Gallery, here. 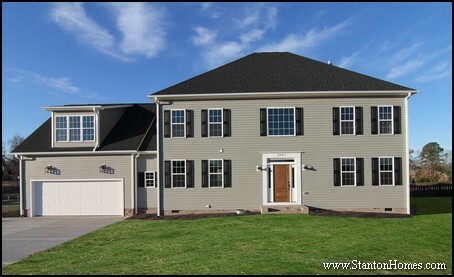 The Coventry is 2,807 sq ft with 3 bedrooms, 2.5 baths. The tucked-in front porch is just the beginning - step inside this main floor master home, and see how well the open concept rooms flow. An island kitchen opens to a vaulted keeping room. The two story living room, just around the corner, has a second fireplace. See the Coventry Photo Gallery, here. 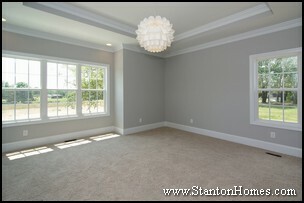 The Worthington II is a Stanton Homes custom floor plan with 2,834 sq ft, 4 bedrooms, 3.5 baths. 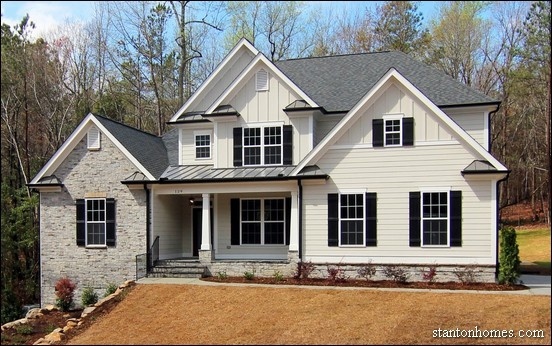 This Raleigh custom home offers four bedrooms and three and half baths with a first floor master suite. Outside, you're greeted by a colonial exterior. Inside, an urban loft design meet classic white and blue kitchen features. See the Worthington II Photo Gallery, here. These floor plans keep the master suite on the first level. Most popular layout options include a sitting area, large walk in closets, lots of bathroom storage, showers for two, and tile soaking tubs. Here are five downstairs master floor plans that hit all the high points. 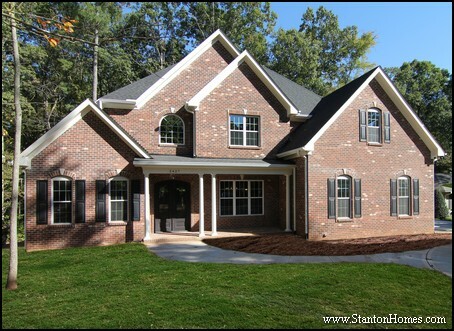 This downstairs master suite plan was featured in the Wake County Parade of Homes. The bedroom bumps out into a reading bay. 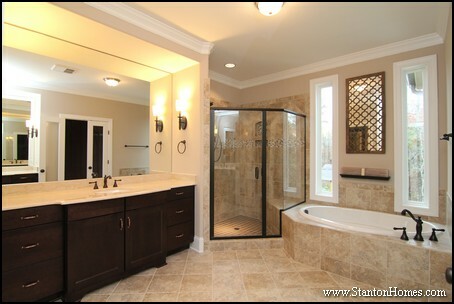 The master bath separates into a his and her vanity with freestanding tub in between. And the master closet has a center built in cabinet with mirror above. View the second story of this floor plan - click here. Need more space to spread out in the master bedroom? 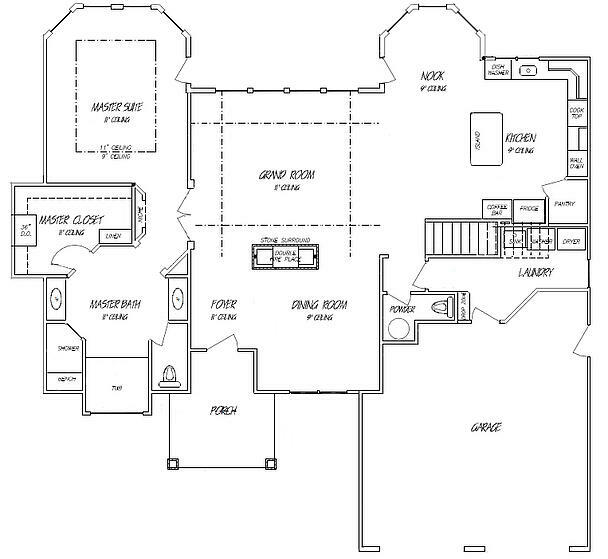 This plan has a full sitting room attached to the master suite. And check out the massive walk in closets. View the upstairs floor plan - ask us for a brochure here. 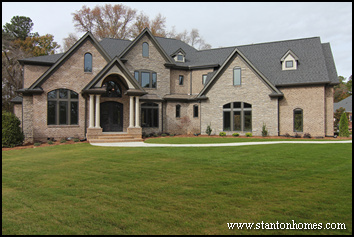 Stanton Homes modified The Dinsmore floor plan to build in five bedrooms and four and a half baths. Here is the modified version. The Dinsmore is copyright Alan Mascord. What did the original plan look like? What's upstairs? Click here to find out. Like the downstairs layout? See what's upstairs, in the full floor plans here. Farmhouse style downstairs master bedroom floor plan. 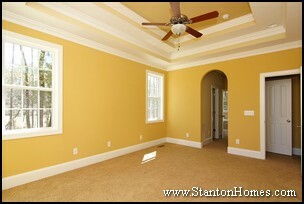 The master bedroom is large, with two separate walk in closets and a spacious bath (and canteliever tub). See the full floor plans for this home - click here. 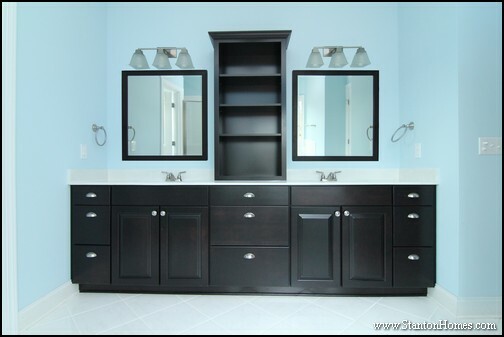 Inside the master bathroom of this floor plan: a single his and her vanity with open shelving in the center. Do you want to find a new home with the master downstairs? 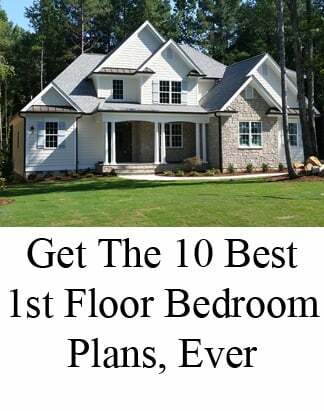 In general, a two-story home with a main floor master bedroom will have a higher per square foot cost than a two-story home with all bedrooms located on the second floor. Why do main floor master suite homes cost more? - Any time there is an extra "corner", costs increase. More materials are used, and more are wasted making additional cuts. More labor is required. There's a reason a lot of builders charge extra for vaulted, cathedral, or trey ceilings. They have a materials and labor cost as well! Cathedral and vaulted ceilings can require extra beams, different framing techniques, longer than standard framing materials, and more. Homes with main floor master suites often have at least one vaulted room. But if the home plan you choose does, the driveway and pathway costs may be slightly higher - it all depends on how the home is situated on the lot. In general, expect to pay about 10-20% more per square foot for a home with a main floor master suite than one that has about the same square footage on both floors. If you already know that a first floor master is right for you, Stanton Homes will help you build the home you've always wanted. If you haven't decided yet, both home styles have a lot to offer, for different reasons. We'll help you find the right floor plan to fit your budget and lifestyle. 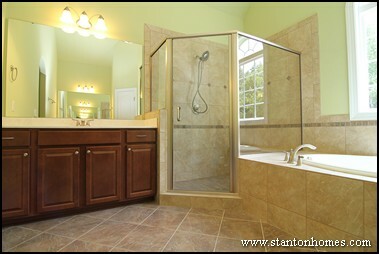 Check out video tours of our Top 5 Most Popular main floor master suite homes of 2011! These classic designs with unique detailing have withstood the test of time, and include contemporary, craftsman, and traditional layouts. Or ask us about design/build options.